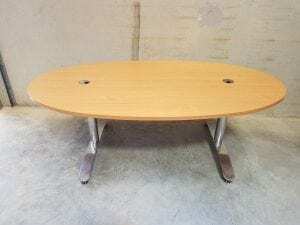 We currently have this used maple oval meeting table on wheels in stock, which you can view more accurately by clicking the images to the left hand side of the page. The contemporary table comes with 2 cable ports and sits on a robust brushed chrome base. Dimensions: 2000 x 1070mm.